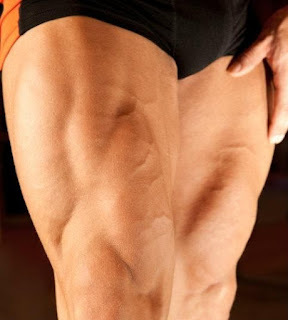 My quads look exactly like this. I had three main goals for training this year: find a team, get back into racing, and figure out my strengths and weaknesses. I've achieved the first two, but the third has evaded me. I still don't feel like I have a good handle on what I'm good at in cycling. In triathlon, I always told people that I was best at transitions, because I didn't think that I was very good at any of the three sports. Of the three, cycling was my strongest and the one that I enjoyed the most. Because of my background with triathlon, I'm pretty good at time trials. But that time trial skill doesn't carry over into races; I can't hold high power for long duration in races, like in a breakaway. Or the power that I can sustain isn't high enough to keep me away from a pursuing group, anyway. So I'm decent at time trialing, but it doesn't carry over to actual races. I've considered that I might be a good sprinter, because I'm kind of built like a sprinter--small frontal profile with massive thighs. I've also assumed that I'm not a very good climber, because I'm so heavy relative to my size. But when I think back to this season, I've done well in hilly races. I think I might be a good climber. Sprint-wise, I have an okay kick, but I'm never positioned well enough for it to really matter. So I'm good at climbing, but I lack the right build to be excellent at it; and I'm good at sprinting, but only during workouts (I haven't won any races out of sprints . . . or at all). Then the other day I did a TrainerRoad workout that got me thinking. It was intervals of 30 seconds overgeared (slow and heavy) followed by a ramp from just below threshold power to just above. And I was really good at them. I could lay down 500+ watts for 30 seconds. In my highest gear and with the resistance cranked on my trainer, I couldn't slow my legs down below 80 RPM. I don't suppose it should be very surprising, considering the size of my quads, but I'm really strong. I think that's my strength, cycling-wise. Strength. I'm strong at . . . being strong. Yay! Now if I can just figure out how to use that in racing . . .